You don’t have to be an American for All-Clad to steal your heart (or your kitchen) – especially when it comes to All-Clad’s Copper Core cookware. 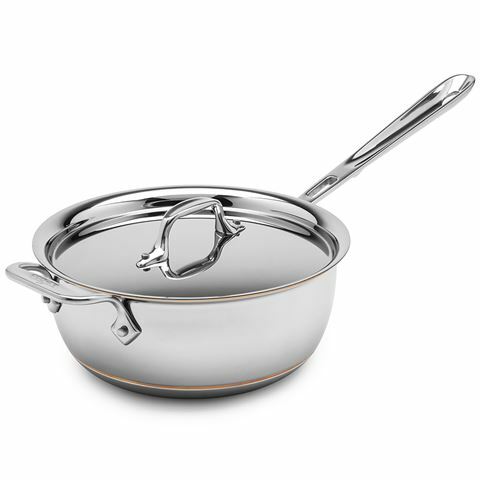 Copper is an exceptional conductor of heat, and within this cookware range, it’s been combined with layers of 18/10 stainless steel, aluminium and magnetised stainless steel to create cookware that is suitable for use on all cooktops, including induction. With long stay cool handles, rolled rims, and an easy clean surface, All-Clad’s Copper Core cookware will take your cooking to new heights. We just hope you’re ready! Constructed from five layers layers of metal – magnetic stainless steel on the outside, an aluminium layer, a copper core, a second aluminium layer, and 18/10 stainless steel on the inside. Copper core for maximum and even heat conductivity. Long-stay cool handles and stick-resistant interior. Rolled edge promotes dripless pouring. Although the handles of the Copper Core range are designed to stay cool, they may still become hot during use. To clean the copper exterior, hand wash is recommended. You may place this range in the dishwasher, but the copper band will tarnish.